If there's any glare on your screen right now, you're going to have to trust that this latest SOMA trailer is more than just a radio play. 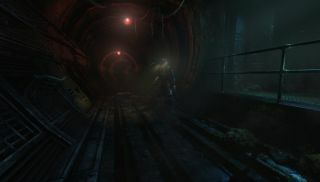 It's a dark and moody teaser; one that shows locations from Frictional's sci-fi horror over a conversation about an experiment that, to put it mildly, isn't going to plan. That's the exciting thing about science, there's always a new challenge to face. New, horrible, and deadly challenges. "It's important that SOMA is constantly drenching the player in storytelling. We need to make sure there is always a red thread of narrative running through the game. We don't want you to say “Oh, here comes a puzzle section”, but to constantly feel as if you are being told an interactive story. Getting this right is tricky as there still needs to be some challenge in progressing, but not so much that solving a difficult puzzle becomes your sole focus. Now that we're close to alpha it's possible for us to test this and tweak where needed." They also claim that, unlike with Amnesia, SOMA is designed to be more grounded in the real world. "Our goal here is to make proper sci-fi and not just a magical fantasy with futuristic designs," they write. We're still a long way off from SOMA's release, which is set for sometime in 2015. In the meantime, Frictional have been using the setting for moody videos and live-action performances. There was The One Where A Old Television Causes Somebody To Freak Out , and also The One Where A Robot Thinks That It's People . So far, the Amnesia devs have released only one video that gives an idea of how their next game will play. You can see that below.